Open to all members this is the last friendly game of this season. 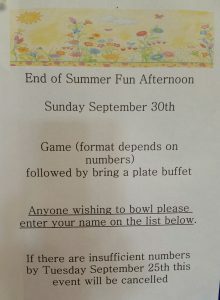 It will be played at Church Gresley and players to bring a plate of food for the buffet. We will be drawing the winners of the end of season prize draw after the game. Please enter name on friendly board or see Scott Standing. Three Church Gresley juniors had a great day at Rugby in the under 13 singles competition. 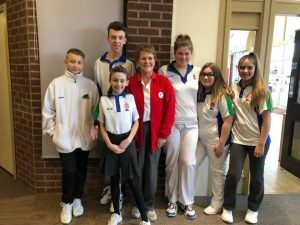 Connor played for the second year and did well, Scarlett and Ellie were playing in their first singles competition and both did very well against opposition from all over the UK. Scarlet came third in her group and Ellie Second in her group and went on to the quarter finals. Ellie also won a fun comp by getting the highest score. A great day enjoyed by the kids , parents and grandparents. What a great day at Potters for our juniors. Everyone enjoyed the experience and both teams won games. In their groups. One of our juniors Alice Atkin has being selected as runner up in the Active South Derbyshire Junior Sportsperson of the Year awards. Well done to Alice who has trained hard since we started our junior section 5 years ago. Fun game of bowls followed by tea and cakes to celebrate the Royal Wedding. Dress in Red, White and Blue.